The benefits of LED lighting continue to add up. Design, function, energy and cost savings are all improved when compared to conventional metal halide or fluorescent fixtures. In today’s world, businesses and commercial spaces are constantly searching for new ways to reduce costs and save their business money. LED fixtures, both for commercial applications and architectural lighting designs, have enormous cost savings potential. Reducing energy usage, waste, and maintenance costs all add up to a more efficient technology and better-looking bottom line. LED fixtures for commercial and architectural applications have a variety of benefits beyond cost savings, but any business looking to reduce costs should consider updating their lighting fixtures with modern LED options. It becomes incredibly clear why commercial and architectural lighting has made the move to embrace LED fixtures when looking at the energy being consumed by outdated technologies. Incandescent lights use 10% of the energy they consume to create visible light, the rest is wasted in the form of heat. Halogen fixtures end up wasting 80% of the energy they consume in the form of heat and only 20% of that energy is actually used to create visible light. 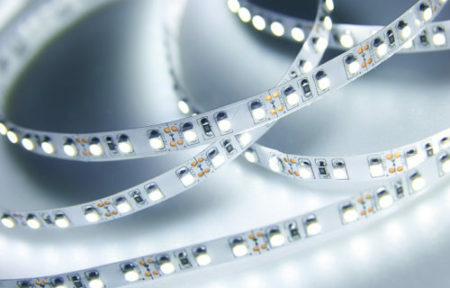 LED’s on the other hand turn 80% of the energy consumed into visible light and only 20% is wasted in the form of heat. LED’s are by far the most efficient technology. Furthermore, LEDs can be recycled unlike incandescent bulbs. Using highly efficient LED lighting fixtures for commercial and architectural lighting applications can have a profound impact on the carbon footprint of warehouses, commercial spaces, and large buildings of any kind. LED lights can last up to 25 times longer than incandescent and halogen. This technology even outshines CFLs, with the average LED lasting three times longer than their mercury gas filled counterparts. With an expected operating time of up to 50,000 hours, that means that even if LED lights are in operation for eight hours a day, seven days a week, these lights would last around 10 years before burning out. The impressive resilience of LED technology makes them a perfect option for lighting fixtures in hard to reach areas as well as any commercial or architectural application. Architectural lighting focuses both on function and design. Fixtures must be visually appealing while also delivering the desired illumination. The versatility of LED technology allows them to be incorporated into sleek fixtures like the Lumenera line. Powerful lighting solutions paired with an elegant design make LED technology the perfect option for architectural lighting solutions. LED technology has come so far over the past few years. Costs have fallen and more business owners are taking the steps to outfit their facilities with LED fixtures. Businesses in search of cost effective, energy efficient, versatile lighting solutions finally have the ability to achieve each one of these goals by utilizing a single technology. Commercial and architectural lighting is experiencing an incredible transformation, pushed forward through highly efficient and reliable LED technology. For more information on upgrading the lighting in any commercial space or including LED lighting into an architectural project, call an RLE Industries lighting professional today at 888-318-0500.